Wow, I came on here to download this theme for a second time – only to see that all the reviews given were 1 stars. I have used it with great success on my website vondt.net (sorry, its in norwegian – but you should be able to see that the design works flawlessly). I haven’t used the slideshow function though, as I see most negatives are aimed at that function. Yes, it did have some hickups in the original source code, but these were quite easy to fix.. feel free to contact me via the website or otherwise and maybe I can help you out. I have created a child-theme with one or two small customizations (slightly larger headings in side widgets and some color/text size changes), but otherwise have v1.2.3 working as perfectly as it was intended to. This includes the slideshow functionality on the homepage. See BoffoSocko as an example. Next be sure to actually set a “Featured photo” for the post–930×300 pixels is the optimal photo size if I recall. Now when you visit your home page, the slider should work properly and include arrows to scroll through them (these aren’t as obvious on featured photos with white backgrounds). Note that on individual pages, you’ll still have static header image(s) which are also customizable in the “customize” section of the WP dashboard, which was mentioned in step 1. INFORMATION THEORY is the new central discipline. This graph was from 20y ago in the seminal book Cover and Thomas, as the field was starting to be defined. Now Information Theory has been expanded to swallow even more fields. Born in, of all disciplines, Electrical Engineering, the field has progressively infiltrating probability theory, computer science, statistical physics, data science, gambling theory, ruin problems, complexity, even how one deals with knowledge, epistemology. It defines noise/signal, order/disorder, etc. It studies cellular automata. You can use it in theology (FREE WILL & algorithmic complexity). As I said, it is the MOTHER discipline. I am certain much of Medicine will naturally grow to be a subset of it, both operationally, and in studying how the human body works: the latter is an information machine. Same with linguistics. Same with political “science”, same with… everything. I am saying this because I figured out what the long 5th volume of the INCERTO will be. Cannot say now with any precision but it has to do with a variant of entropy as the core natural generator of Antifragility. I’m coming to this post a bit late as I’m playing a bit of catch up, but agree with it wholeheartedly. In particular, applications to molecular biology and medicine are really beginning to come to a heavy boil in just the past five years. This particular year is the progenitor of what appears to be the biggest renaissance for the application of information theory to the area of biology since Hubert Yockey, Henry Quastler, and Robert L. Platzman’s “Symposium on Information Theory in Biology at Gatlinburg, Tennessee” in 1956. At the beginning of September, Christoph Adami posted an awesome and very sound paper on arXiv entitled “Information-theoretic considerations concerning the origin of life” which truly portends to turn the science of the origin of life on its head. I’ll note in passing, for those interested, that Claude Shannon’s infamous master’s thesis at MIT (in which he applied Boolean Algebra to electric circuits allowing the digital revolution to occur) and his subsequent “The Theory of Mathematical Communication” were so revolutionary, nearly everyone forgets his MIT Ph.D. Thesis “An Algebra for Theoretical Genetics” which presaged the areas of cybernetics and the current applications of information theory to microbiology and are probably as seminal as Sir R.A Fisher’s applications of statistics to science in general and biology in particular. For those commenting on the post who were interested in a layman’s introduction to information theory, I recommend John Robinson Pierce’s An Introduction to Information Theory: Symbols, Signals and Noise (Dover has a very inexpensive edition.) After this, one should take a look at Claude Shannon’s original paper. (The MIT Press printing includes some excellent overview by Warren Weaver along with the paper itself.) The mathematics in the paper really aren’t too technical, and most of it should be comprehensible by most advanced high school students. For the more advanced mathematicians, physicists, and engineers Arieh Ben-Naim does a truly spectacular job of extending ET Jaynes’ work on information theory and statistical mechanics and comes up with a more coherent mathematical theory to conjoin the entropy of physics/statistical mechanics with that of Shannon’s information theory in A Farewell to Entropy: Statistical Thermodynamics Based on Information. Below is my response to Adeline Koh‘s article “Path: A Twenty-First Century Geotagging Journal” which appeared in the Chronicle of Higher Education’s Prof Hacker Blog on August 29, 2012. Adeline, Path might be a reasonable tool for accomplishing what you’d like, but it’s original design is as a very small and incredibly personal social networking tool and therefore not the best thing for your particular use case here. Toward that end, it’s personalization ability to limit who sees what is highly unlikely to change as they limit your “friends” to less than your Dunbar number in the first place. Their presupposition is that you’re only sharing things with your VERY closest friends. Unbeknownst to many, most cell phones and increasingly many cameras will utilize GPS chips or wifi to geolocate your photo and include it in the EXIF data imbedded into the “digital fingerprint” of your photo (along with the resolution, date, time, what type of camera took the photo, etc.) For this reason, many privacy experts suggest you remove/edit your exif data prior to posting your photos to public facing social media sites as it can reveal the location of your personal home, office, etc which you may not mean to share with the world.) There are a number of tools you can find online for viewing or editing your exif data. You can then upload those photos to Google Plus which will allow you to limit your sharing of posts to whichever groups of people you’d prefer with a high degree of granularity, including using email addresses for people who aren’t already on the service. (They actually have a clever back up option that, if selected, will allow your phone to automatically upload all your photos to G+ in the background and making them private to you only for sharing at a later date if you choose.) I’m sure that with very little work, you can find some online tools (including even Google Maps perhaps) that will allow you to upload photos and have them appear on mapping software. (Think about the recent upgrade in Craigslist that takes posting data and maps it out onto the Openstreetmap.org platform). Finally, as part of Google’s Data Liberation initiative you can go in and export all of your data for nearly all of their services including Latitude and from Picasa for photos.I think that playing around with these interlocking Google tools will give you exactly the type of functionality (and perhaps a little more than) you’re looking for. Library shop classes? Of course! The Sheridan Libraries offers many tools to help you with your library research. While you can always stop at the Reference Consultation Office on M Level, use our Ask a Librarian service, or contact your liaison librarian with any questions you may have, we also offer workshops about specific tools. These tools include databases and citation management programs. Below is a list of our Fall Workshops, with links for registration. Tues., Sept. 20, 2011, 11:00-12:00 Wed., Sept. 21, 2011, 4:00-5:00 One class can help trim hours off your time spent researching and writing. Come learn the secrets of organized citations and easy, quick bibliographies. Wed., Sept. 28, 2011, 2:00-3:00 Wondering what tools can help keep you and your papers organized? We provide a comparison and overview of several popular tools. 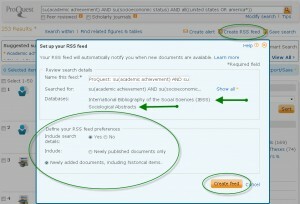 RefWorks, Mendeley, Zotero, and Papers will be included. Wed., Sept. 28, 2011, 4:30-5:30 Help your research and save your time: learn to use these two powerful tools in the most effective ways. Feel free to bring topics that we can use as search examples! Tues., Oct. 4, 2011, 4:00-5:00 You seek. But do you find? Join us for a tour of Google, Google Scholar, and Google Books. Learn how they really work and how to make the best use of each. Wed., Oct. 5, 2011, 4:30-5:30 We love reading our fun fiction on our mobile devices, but the JHU libraries have 1 million academic e-books as well. Bring your e-readers, tablets, and any mobile device that you use to read books. Find out which e-books can/can't be downloaded directly to your e-device, and practice while the librarians are there to help. Wed., Oct. 12, 2011, 10:30-11:30 With the increasing use of images, music, and other kinds of audio-visual resources as well as the delivery of course content through online course management systems like Blackboard, scholars and academic institutions are facing challenges as to what constitutes fair use and what does not. Therefore, the aim of this workshop is to create awareness about some of the challenges related to copyright and provide an electronic toolkit for the participants. Wed., Oct. 12, 2011, 6:00-7:00 Want to impress your friends and professors alike with research skills that would surpass those of Sherlock Holmes? Detective-Librarians Chella and Heidi will lead you on a madcap journey through Victorian London as we discover the secrets of the Crystal Palace. Gumshoes will have the opportunity to put together their own case files explaining the who, what, when, where, and whys of the Crystal Palace! Wed., Oct. 26, 2011, 5:00-6:00 Great tips for using the tools within PubMed that will help you find exactly what you want, much more quickly. You'll be able to practice online, too, while the librarians are there to help! I hope that some discusses LibX in some of these presentations. It’s my favorite new research tool! This is a great short article on bioengineering and synthetic biology written for the layperson. It’s also one of the best crash courses I’ve read on genetics in a while. “No building on campus can be taller than Gilman Hall because that’s what’s in Gilman’s will.” Wrong. Decisions about buildings’ heights, including that of the library, have been made based on the scale of the campus and the architecture of Homewood House. Stand at the middle of the lower part of the beach, and look through the glass windows of MSEL. Notice anything? That’s right–Gilman Hall is beautifully framed in the center. Gilman died in 1908, and mentioned nothing in his will about buildings. In 1912, the Trustees began to plan a new “Academic Building.” This was completed in 1915, and formally named after Gilman in 1917.
library opened on November 15, 1964, there were just over 1.1 million books on the shelves. Second, no sinking occurred. The weight of the thousands of shelves and books had been calculated into the plan, and the foundation was, and remains, more than adequate to hold the weight. One thing that is true about the library is that when the hole was dug, an underground stream was discovered, and had to be rerouted before work on the building could continue. John Berthel, the library director at the time, poses in the recently dug hole with some of the books that would later grace the shelves. In the 1930s, a French mathematician began writing journal articles and books. His name was Nicolas Bourbaki. He didn’t exist. Bourbaki was and is actually a group of brilliant and influential mathematicians, mostly French but not all, whose membership changes but whose collective purpose remains the same: to write about mathematical topics they deem important. Between 1939 and 1967 “he” wrote a series of influential books about these selected topics, collectively called Elements of Mathematics. A mysterious, mostly anonymous group of writers publishing momentous things under a single name is just really cool. But don’t try to read any of his stuff unless you are an expert mathematician. Instead, read a wonderful story by novelist and award-winning chemist Carl Djerassi, called The Bourbaki Gambit. What do you think happens when a group of scientists, being discriminated against for various reasons, team up and use the “Bourbaki” approach to try to get their latest discovery taken seriously? Q: When did Nicholas Bourbaki quit writing books about mathematics? A: When (t)he(y) realized that Serge Lang was only one person!